Black and Grey Tattoos are a time-tested trend that never goes out of style. 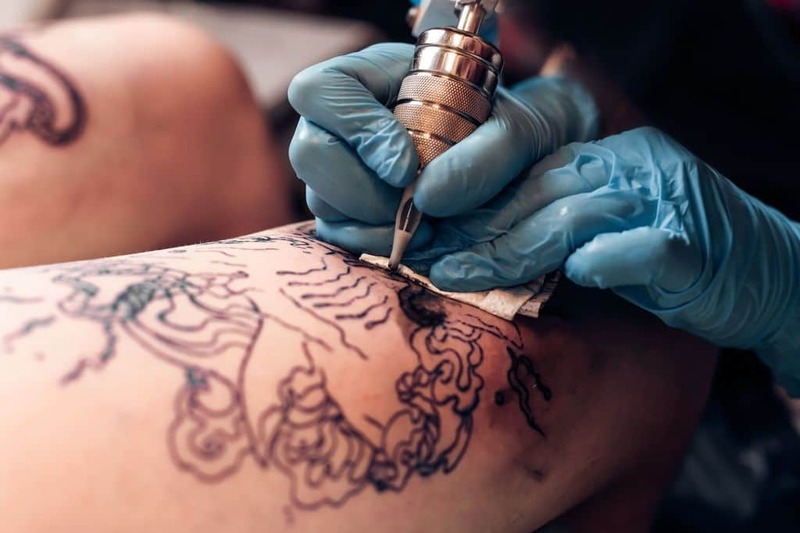 Read this and know everything you want to about the style before getting inked. When you’re planning your tattoo, it’s easy to want to go as bold as possible. You want something bright and eye-catching, with as many colors as your artist can offer, right? Not necessarily! Sometimes, a little less is a lot more. Black and grey tattoos more than hold their own when it comes to standing out. And while tattoo color is all about personal taste, we’ll run through the reasons that you should consider going greyscale for your next tat. We all know how you make grey from black, right? Just add a bit of white. With tattoo ink, though, it’s not quite that simple. While black ink’s composition is pretty standard for tattoos, making grey shades is where things get a bit more complicated. Some tattoo artists prefer to dilute the black ink with water, which allows them to create exactly the shade they want. Other artists use grey ink and black ink together. Sometimes, artists will also use a bit of white ink to really maximize the contrast and make certain details pop. Greys that are made from diluting black ink tend to fade more quickly than grey ink. However, grey ink is a lot more difficult for a tattoo artist to use, and doesn’t always give the artist the same flexibility. So now that you’ve got the lowdown on how they work, what makes them a great choice for your next tattoo? One of the big advantages of black and grey inks is that they tend to cause fewer allergic reactions than colored inks. This means it tends to cause less irritation or other issues during the ink session or in the days after. If you are concerned about allergies, you can always talk to your tattoo artist. They can give you the lowdown on what’s in their inks. That way, you won’t have any unpleasant surprises. Plus, unlike color, black ink shows up well on all skin tones. A black and grey tattoo always stands out. Of course, no one gets a tattoo thinking that they are going to get it removed. But if you’re a little nervous about the permanence, it may help to know that black ink (along with green and blue) tend to be the easiest to have removed. Black and grey tattoos also tend to fade less than color inks. They are way less prone to sun damage. If you spend a lot of time outdoors, black and grey is a safe choice. Since they don’t fade as much, this means that you wouldn’t have to touch your tattoo up as often. The simplicity of black and grey also means that it is easier to modify your tattoo if you want to change things up. You could even add some color later! One of the greatest advantages of black and grey tattoos is how great they make realistic art look. Like a tasteful black and white photograph, with a skilled artist, these tattoos can look absolutely stunning. The black and grey color scheme adds a level of drama and sophistication that is hard to match! Your tattoo artist is able to shade with grey, almost as though they were drawing with a pencil. This means they can make very realistic images. They can stunningly capture the details of an image, whether that is the fur on a dog or the many petals of a rose. They work especially well for serious, meaningful images like memorial tattoos. Your tattoo artist can bring out a beautiful, timeless portrait of your loved one in black and grey. Do you already have a couple color tattoos? Or maybe you’ve got a couple ideas in the works? A great black and grey tattoo can ground your more colorful pieces, bringing out the best in both of them. Black and grey tattoos are an especially great choice when you are looking for something small. A small tattoo can be striking when the color scheme is kept simple. That way, your message comes across clearly in the small space. Patterns are also powerful in a black and grey color scheme. Whether the pattern is geometric, tribal, or anything in between, the simplicity of black and grey make a powerful statement. Geometric patterns are particularly popular at the moment. Their simplicity suits a black ink style perfectly! Are you thinking of getting your first tattoo? Black and grey ones are a great way to dip your toe in the lake, so to speak. That’s because getting black and grey ink tattoos usually take less time than color ones. So, if you are nervous about how long you’ll be sitting in the chair and how much it will hurt, a shorter appointment will certainly make things easier. Another bonus? Not using color for your tattoos also tends to cost less. Are you thinking about getting black and grey for your next tattoo? With the many benefits, from cheaper cost and less fading, they are a practical choice. But a tattoo should be much more than practical. The many benefits aside, we’ve fallen in love with black and grey tattoos for their style and sophistication. They can offer beautiful realism and sophisticated shading. You can go bold with patterns. Plus, they keep small tattoos looking clean and clear. If you’ve thought long and hard about it and decided black and grey is the way to go, it’s time to find an artist whose style matches your idea. Reach out, and we can work together to create the tattoo you’ve always wanted.